As I was driving back from Colorado this last weekend during the big freeze that took place and coated everything in ice, I got a chance to visit my cousin in Southern Missouri who I hadn’t seen in a while (first time visiting since he moved there). It was quite a journey – you can see a few photos below and more on facebook, but in doing some more Tiny House research I found a Tiny House for sale about 90 minutes south of where my cousin was, pretty much en route back to Huntsville. So of course, I had to call up and make an appointment to see this Tiny House for sale. So the next morning I drove through the 8 inches of snow that fell (luckily it had warmed up to 34 degrees so everything was melting or it would have taken a real long time!) to meet Ed and take a look at his Tiny House for sale (see below). He had the tiny house parked facing a small creek in the trees – it was a cool spot showcasing the potential of Tiny House living in that tiny home. The back story on the home is that it was part of a trade for a couple from Ohio who had built the tiny house and then moved down to Southern Missouri with it and traded it in part for some land. Own a Tiny House for under $10,000? Yes. And it’s ready to go. The unit is plumbed and wired for electricity and ready to live in. It has a propane hot water heater, propane oven and stove, small though neat shower and tub, composting toilet, 2 lofts (one big enough to sleep on a queen mattress), a couch, mini-fridge, ample counter top space all in around 150 sf (I can’t remember the exact length of the trailer). Personally, I would customize it a little more and add my own finishing touches but it has everything you need to live (just need a water and electric supply of course). You can find the Craigslist listing here and Ed’s website who’s listing it for sale is http://homesteadcrossinginc.com. He sells lots of land all over, so who knows, perhaps we can work together to create the next Tiny House Community there? Want to learn more about the new Tiny House Community we’re creating? It’s called the New American Dream Project and you can learn more and get involved in the movement here: New American Dream Project. PS> Blogging is an activity you can easily do from within a Tiny House. 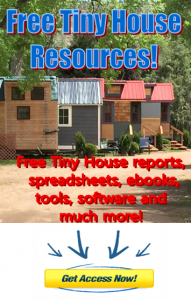 Have you thought about how you can earn income while living in a tiny house? I’d encourage you to start creating an additional income stream now so that you can really live that freedom lifestyle and take advantage of the mobility a Tiny House can give you. Click here to learn more.